More voters trust Hillary Clinton than Donald Trump on nearly every key issue a feat not achieved by any candidate in recent elections, according to polling data aggregated by The Huffington Post. Trump trails Clinton in voter trust on each of the issues that typically rank highest in people’s minds when evaluating a presidential candidate the economy, immigration, terrorism, national security, foreign policy, social issues and criminal justice, according to a HuffPost aggregation of polling data. Clinton even leads on the topics that Republicans have historically been perceived as better-equipped to handle. HuffPost looked at “trust” questions from all publicly available polls between July and August that met the criteria for HuffPost Pollster. The numbers reported are the averages of these polls. Trump’s deficiencies are unprecedented in the 21st century, according to polling data collected by the same method over the course of the past four general elections. During the 2008 contest between then-Sen. Barack Obama and Sen. John McCain, the last election cycle this century in which an incumbent was not a contender in the race (thereby eliminating incumbency advantage), McCain earned the majority of voters’ trust on half of major voting issues. The last Republican president, George W. Bush, won three of these six issues when he first ran for president in 2000. When he successfully ran again as an incumbent in 2004, he won three of the five voting issues. This portends anything but good news for Trump. He not only fails to amass a majority of voters’ trust on issues that previous Republican candidates have won, but also performs poorly on issues that his campaign has made central to its message. Improving national security and tackling terrorism are central tenets of Trump’s campaign, and are issues that both Bush and McCain won by decisive margins during their electoral bids. In this election, however, Clinton leads Trump on the issue by an average of 2.1 percentage points. 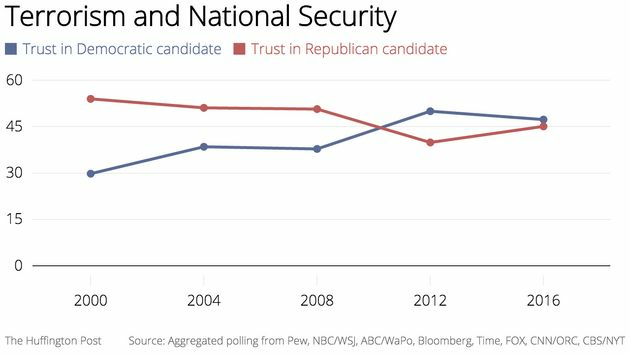 A Democratic lead on terrorism and national security issues is not entirely unprecedented, however. In 2012, presidential incumbent Obama trounced GOP nominee Mitt Romney in this realm, toppling Romney by an average of 10.1 percentage points. 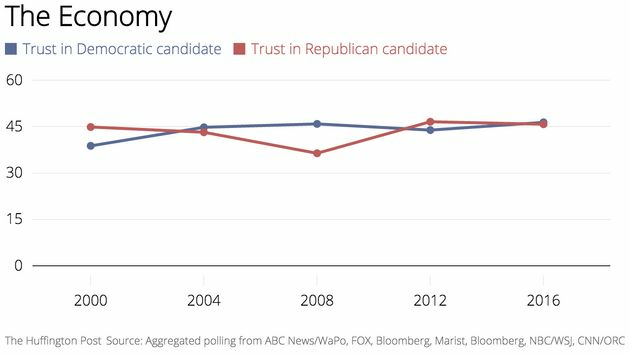 Trust on the economy is a mixed bag: Democrats clinched a narrow victory in 2004, and a slightly larger one in 2008. Republicans pulled ahead in 2000 and 2012; the latter of which was an election year in which the GOP nominee was Romney, a candidate whose reputation was in large part predicated on his success in business. Trump has also campaigned on his reputation as a businessman, but that strategy doesn’t seem to be working as well as it did for Romney. Clinton leads narrowly on the issue by 0.6 percent on average. 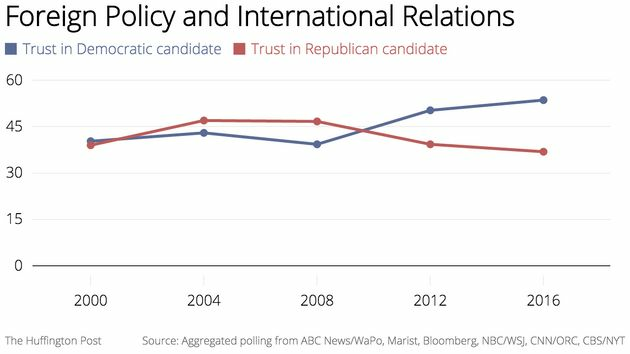 There’s varied data on international relations and foreign policy trust over the years Democrats had a slight edge in 2000 and a greater one in 2012; Republicans pulled ahead in 2004 and 2008. In 2016, however, we see the most decisive victory for any presidential candidate on the issue in recent history: Clinton leads Trump by a formidable 16.7 percentage points. This significant lead is presumably attributable in part to Clinton’s four years conducting foreign policy as secretary of state. Pollsters only sampled voters’ trust on immigration in the 2008 and 2012 election cycles. Obama generated more confidence in 2012 against former Gov. Romney, while in 2008 McCain topped Obama on the issue. 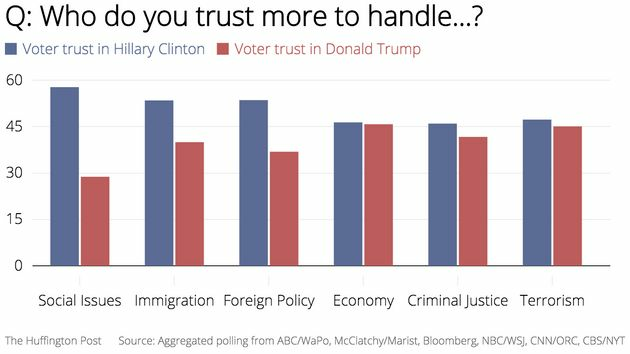 Despite Trump’s hardline immigration policy, the chief component of which is to build a wall separating the United States and Mexico, trust in Clinton far surpasses trust in Trump by a margin of 13.5 percent. The Democratic lean on every major voting issue poses a clearer problem for Trump when contextualized by his performance on some of these polling questions in the past. In April, Trump was leading Clinton on the economy question by a 5-point margin, according to a CNN/ORC poll. The same poll now shows Clinton leading on this issue by 2 percentage points in July, the poll’s most recent release. These results are also devastating for Trump given that his relatively extreme stances on immigration, terrorism and national security are crucial benchmarks of his primary campaign stances that catalyzed a sentiment propelling him past his fellow GOP primary contenders. The general election, however, is a new animal entirely one that is looking increasingly impossible for Trump to wrangle to his advantage. Polling results included all nationwide polls that would be included in our HuffPost Pollster charts conducted between July through September over the past four election cycles. The data from all polling sources was averaged per voting issue. Approved pollsters included in the aggregation include Pew Research Center, ABC News/Washington Post, Bloomberg, McClatchy/Marist, NBC/WSJ, CNN/ORC, CBS/NYT, Newsweek, FOX, USA Today/Gallup, AP-GfK Roper Public Affairs, LA Times/Bloomberg, Time and Quinnipiac.